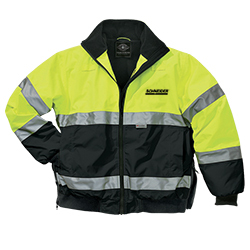 Durable and heavyweight Oxford Polyester with a 2,000 mm coating, creating a waterproof and highly wind-resistant garment, lined with black fleece (13.8 oz/lyd) treated to be antipill. Lime Green color meets all regulations to qualify as a Class 3 approved garment under ANSI 107 standards. 2'' high 3M Scotchlite(tm) reflective tape stripes across the chest, hips, arms and back. Front shoulder loops for radio attachment. Side seam zippers for equipment access. Stand up fleece-lined collar. Inside storm flap. Black rib knit at the cuffs and hem. Zippered front pockets lined with soft fleece/nylon. Zippered inside valuables pocket.